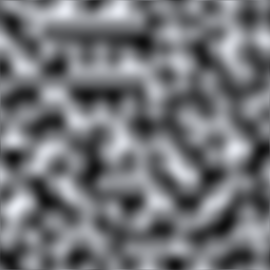 Perlin noise is a pseudo-random pattern of float values generated across a 2D plane (although the technique does generalise to three or more dimensions, this is not implemented in Unity). The noise does not contain a completely random value at each point but rather consists of "waves" whose values gradually increase and decrease across the pattern. The noise can be used as the basis for texture effects but also for animation, generating terrain heightmaps and many other things. Any point in the plane can be sampled by passing the appropriate X and Y coordinates. The same coordinates will always return the same sample value but the plane is essentially infinite so it is easy to avoid repetition by choosing a random area to sample from. // Create a texture and fill it with Perlin noise. // while in Play mode to see the effect they have on the noise. // Width and height of the texture in pixels. // The origin of the sampled area in the plane. // over the width and height of the texture. // Set up the texture and a Color array to hold pixels during processing. // Copy the pixel data to the texture and load it into the GPU. Although the noise plane is two-dimensional, it is easy to use just a single one-dimensional line through the pattern, say for animation effects. Note: It is possible for the return value to slightly exceed 1.0f. You may need to clamp the return value if the 0.0 to 1.0 range is important to you.